SAN RAFAEL, CA, Dec. 28, 2015 – In a house with two kitchens, there is at least one oven always running. Such is the case at the Fourakis household where Glyká-Sweets was born. Effie Fourakis buzzes back and forth from tending dinner in one kitchen to analyzing baking experiments in the other. With a BA in Biochemistry and a Masters in Public Health from the University of California, Berkeley, she is a baker with the approach of a chemist. Effie mastered her arsenal of traditional Greek baked goods right in the comfort of her two kitchens. Effie’s pair of home kitchens set the stage for the early history of Glyká-Sweets, and served as her laboratories while she took to perfecting the desserts of her Greek ancestors. Long nights conducting baking experiments and tinkering with recipes were the building blocks that make up the foundation of Glyká-Sweets. Hard work and ambition are what drove, and drive, Effie and her family as they continue to navigate the challenges of starting a new business and their quest for success in a competitive grocery market. That drive has been the linchpin for the Fourakis family and has helped them overcome the challenges of starting a new business. 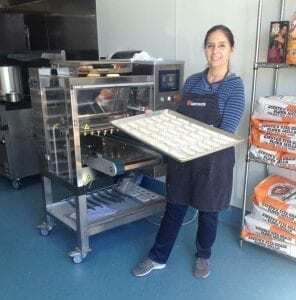 Over the course of three years Glyká-Sweets has grown out of the home kitchens and into their own commercial bakery, located in San Rafael, where all their products are made today. The first two years were mainly spent baking at home, renting time in a commercial bakery in Marin County, selling to friends and family and taking online orders from around the country. This was a time of constant learning and experimentation. Learning the ins and outs of a new kitchen is no simple or easy task, and it can only be done by trial and error, as Effie discovered new product ideas, new methods to cut down production time, and new avenues with which to expand her business. Most importantly, however, she learned how to transfer her baking expertise from a small home kitchen to a larger commercial bakery. Massaging out the kinks of baking with new equipment, while learning the tricks of a new mixer and the tendencies of a new oven, requires three important elements: time, patience, and attention to detail. Fast forward to present day, Glyká-Sweets’ bakery has been up and running for ten months, their products can be found in twenty stores around the Bay Area, and they will be showcasing their products at the Specialty Food Association’s Winter Fancy Food Show January 17-19 at Moscone Center in San Francisco with Savor California at booth #604. Armed with the experience and knowledge that they have acquired over the last three years, the Fourakis family looks to shake up the specialty food dessert market and share with the rest of the world some of the foods that make Greece great.